Detective James Strange is asked by Caleb Caxton to find his octogenarian sister Ellen who has mysteriously disappeared. Strange stays in Caxton's guest house intended for those patients discharged from the hospitals who need rest and quiet and finds a house full of suffering and a concept of duty which includes even killing. First Line: It was May 23rd and I was standing idly by the open window watching them swelter in Kingsway below and wondering if the morrow's Derby would hang another scalp on my belt. 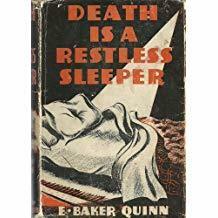 Sign into Goodreads to see if any of your friends have read Death is a Restless Sleeper.